What We Do in the Shadows is a dryly hilarious, straightforward mockumentary that never breaks while skewering the loir around vampire mythology and iconography. Co-written, co-directed, and co-starring New Zealand comedians Taika Waititi and Jemaine Clement (collaborators on the similarly excellent Flight of the Conchords HBO show), the film really invests in its fresh take on old characters to mine simple yet sophisticated comedy about its subjects so genuinely. The violent and bizarre vampire housemates we follow struggle through the daily troubles of undead life explaining everyday living to the camera and fake documentary crew. It's sort of like The Office set in a house of vampires but goes so much further than that basic premise. The pseudo-documentary structure really allows for the viewer to buy into the material and for the characters to reveal subtle development as the plot and vampiric set pieces unfold. There's even a welcome but unexpected sweetness during gruesome acts of violence used for sight gags and physical comedy. The vampires all serve different personality types and devices in the film, satisfying different structural and narrative needs (almost like members of a boy band). Waititi is a middle-aged, lovelorn dandy full of positive energy. Clement is the dark, more unpredictably violent bad boy, Vlad the Poker, who's also a sad pappy inside. Jonathan Brugh is the young, cool guy, rock 'n roll type who doesn't play by the rules as early on, Cori Gonzalez-Macuer as Nick becomes the new guy, quickly converted from human to vampire as the audience cypher to reveal the ridiculousness of vampire life. Stu Rutherford and Rhys Darby round of the well-balanced group of naturalistic comedians as the loyal human friend and dryly hysterical leader of a werewolf pack, respectively. The versatility with which Waititi and Clement use vampire characters lends itself to situational comedy so well. 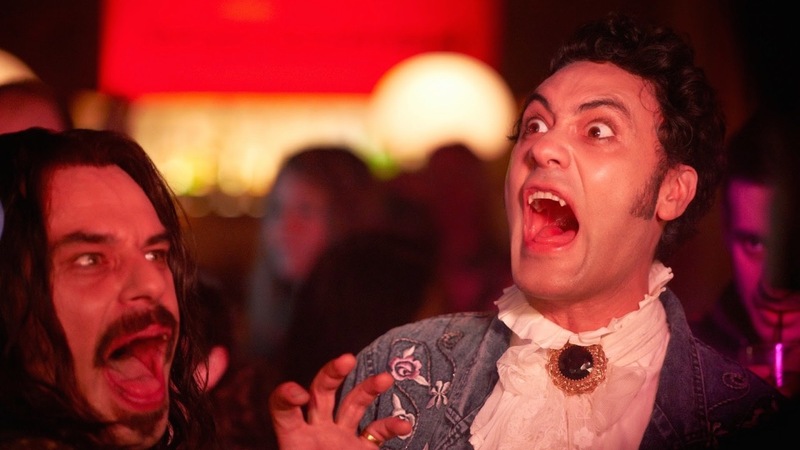 What We Do in the Shadows uses its joyous and well explained premise to tie together essentially a loose series of sketches together for a tight 90-minute runtime. The film sublimely mixed the mundanity of small-town Wellington life with the supernatural effortlessly while aping reality television tropes. It's a fun film full of bite and substance with a lot of well-earned laughs.